FGCU couldn’t hope for a better ambassador for its service-learning program than Daniel Hernandez. On Oct. 28, the 2015 business management graduate stood in a room packing zucchini and yellow squash into red net bags alongside a couple dozen other Make A Difference Day volunteers from FGCU, Wells Fargo and the Harry Chapin Food Bank. Volunteers pull rubbish out of waters at the Vester center. Hernandez may have initially needed a little push himself to overcome shyness, but he more than made up for it, eventually working in FGCU’s Office of Service-Learning and Civic Engagement and at Harry Chapin. He has participated in Make A Difference Day every year since graduating and says he always will. The food bank’s cause hits close to home. He grew up in Immokalee seeing homeless and hungry people every day on the street. Hernandez and other volunteers at Harry Chapin packed 5,500 pounds of produce Saturday — enough for 4,600 meals, according to Tanya Phillips, who coordinates food bank volunteers in Lee County. But FGCU’s involvement doesn’t stop at the end of Make A Difference Day — numerous student organizations and classes volunteer and hold fundraising events throughout the year, she said. The same could be said for many of the dozen other Southwest Florida locations where about 350 FGCU and Wells Fargo folks volunteered Saturday — while FGCU Alumni Association chapters pitched in in cities across the country. 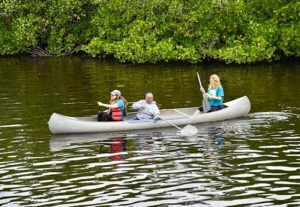 Volunteers elsewhere pulled trash and debris out of mangroves near FGCU’s Vester Marine and Environmental Science Research Field Station in Bonita Springs; they cleared bike trails at Collier County Parks and Recreation’s Pepper Ranch Preserve in Immokalee; they painted, mulched and built planters at the Quality Life Center in Fort Myers. 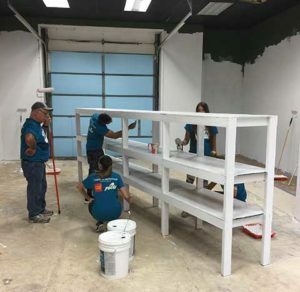 Volunteers paint at a Habitat for Humanity ReStore. 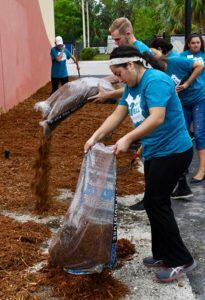 Volunteers mulch at the Bonita Springs YMCA. 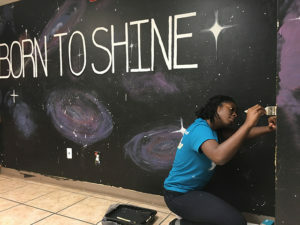 FGCU senior Shelleka Darby chose to volunteer there the past two years because of the 25-year-old organization’s mission: to strengthen families and communities by instilling values such as honesty, integrity and discipline in young people at risk. This was the sixth year FGCU and Wells Fargo worked together for Make A Difference Day, a national event created by USA Weekend Magazine in 1992 to encourage volunteerism and demonstrate the impact it can have. The FGCU Foundation, Alumni Association and Office of Civic Engagement and Service-Learning coordinate the university’s Make A Difference Day activities.